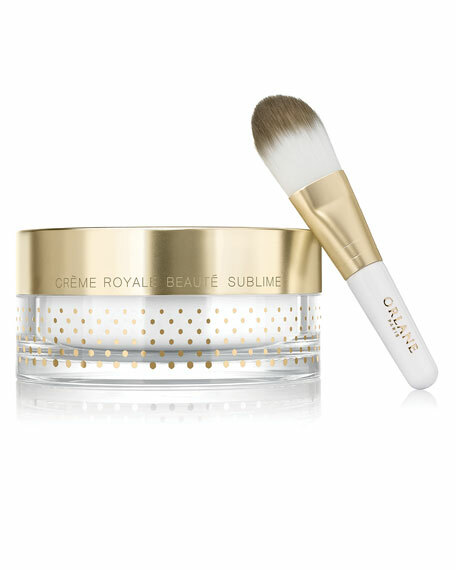 Orlane Crème Royale Sublime Mask, 3.3 oz. OrlaneCrème Royale Sublime Mask, 3.3 oz. The latest institute developed expert skin care product. A flash anti-aging product that rejuvenates the skin so that it recovers its glow and youthfulness. A sensory jelly that provides skin with a true sensation of comfort and well being. Contains Fresh Royal Jelly: Anti-aging and rejuvenating. With a high concentration of trace elements, vitamins and amino acids, this rare and precious substance revitalizes, nourishes, and protects. Also stimulates cell renewal and rejuvenation. 24 carat gold energizes and promotes anti-aging, strengthening the skin's defenses and resilience. Its detoxifying and anti-inflammatory properties and surprising insulating capacity help the skin to fight against attacks and free radicals. Smart ingredient vectorization technology makes it possible to release Royal Jelly in the form of immediate action, via a plant-based micro patch which enables progressive and prolonged release, and in form of nano-phyto spheres targeting release of active ingredients deep within the skin. Directions for use: Apply a thin layer with the brush. To be used as a nightcare treatment once or twice a week, or as an express radiance boosting treatment to be left on for 10 minutes. Remove with a cotton pad dampened with Orlane Lotion or Toner (sold separately).